Indy Eleven tallied its first three points of the 2019 USL Championship season after defeating Charlotte Independence on the road, 2-3. The victory saw three of Indy’s new signings collect their first goals since joining the team ahead of the 2019 season. The Boys in Blue opened the scoring with back-to-back goals within the first 20 minutes of the evening. Eleven defender Macauley “Macca” King buried the first goal of the match, and the first of his professional career, with a one-touch strike in the 12th minute. The Leicester City youth product was on the receiving end of a cross into the top of Charlotte’s 18-yard box from midfielder Kenney Walker. Three minutes later, King placed another strong cross in front of Charlotte’s net. King’s cross resulted in a saved attempt from forward Eugene Starikov and a blocked shot from forward Dane Kelly. Midfielder Tyler Gibson proved that the third time’s a charm when his shot ricocheted off the crossbar and into the net. Indy’s defensive efforts kept the Independence at bay for almost the entirety of the first half. A shot from Charlotte’s Enzo Martinez a minute into first-half stoppage time was the only time Indy goalkeeper Evan Newton was forced to make a save before the half-time whistle. Indy continued to ask questions after the start of the second half with shots in the 47th, 51st and 53rd minutes. Charlotte began to push back with a missed shot by Celtic FC loanee Andrew Gutman in the 63rd minute, followed by a shot from Kevan George three minutes later that forced another save from Newton. Indy’s persistence in the attacking third led to a third goal, this time from 2018 USL Championship Golden Boot runner-up, forward Thomas Enevoldsen. A saved attempt from Starikov saw Indy awarded a corner kick at the top of the 68th minute. Walker took his place at the corner and sent an in-swinging pass in near the center of Charlotte’s penalty box, where Enevoldsen scored off a one-touch volley. The goal was Enevoldsen’s first as a member of Indiana’s Team. Additionally, Walker’s second assist of the evening was his third in two games, having assisted defender Neveal Hackshaw’s goal in Indy’s Week One fixture against Saint Louis FC. A clean sheet wasn’t in the books for Indy, as a header from Charlotte’s Dominic Oduro found the back of the net in the 73rd minute. The Queen City side continued to close the score gap when Gutman placed another header in between the posts from close range 10 minutes later. Indiana’s Team’s first three points of the season can be attributed to the squad’s management of the match. Defensively, Indy outclassed Charlotte in tackles (24) and clearances (21). 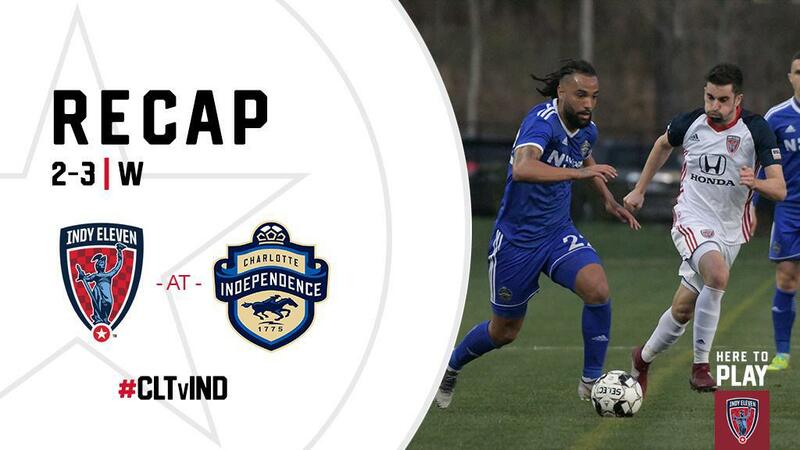 Moreover, Indy’s offensive efforts kept Charlotte in their defending third. The Circle City squad took 14 total shots during the match, seven of which were on-target and 12 were from inside Charlotte’s 18-yard box. The Boys in Blue will have to wait 15 days before returning to regular season action, but the time off will give Rennie’s team another chance to work towards week-to-week play.